Randal began a freelance illustration career working from my home studio in the Chicago area for: designers, ad agencies, corporations, publishers, and others. He specialized in line art illustration, architectural renderings, technical and product illustration used in corporate communications, advertising and print promotion. He expanded into other markets including: New York, Atlanta, Dallas and Minneapolis working through artist reps in those cities. A game changing year. I purchased an Apple Mac Plus computer with 1 MB of RAM, a 20MB hard drive and a dot matrix printer and began to teach myself to use this new tool to aid in the illustration and design process. Within a few years, I was teaching my clients and other communications art associates how to incorporate and leverage emerging new digital technologies in the design and illustration business. I have been using Adobe products since version 1.0, as well as products that were eventually purchased by Adobe such as Aldus Freehand, Macromedia Dreamweaver, and many others. I assisted my customer ComCorp, Inc. in setting up an authorized Apple Reseller called Energés in the late 1980’s before moving my business into multimedia and eventually web design. After seeing the “world wide web” demonstrated at an AMC event, I purchased the domain “BIRKEY.COM” in 1996, figuring I should have the domain of my own last name. Within the following year, I taught himself to code in basic HTML using an early Adobe software product called PageMill. I set up a web and email hosting account at TheRamp.net, an early Chicago area ISP headquartered in Cicero. This was back in the days of 28K and 56K modems, dial-up accounts, and the Netscape Navigator browser version 1.0! 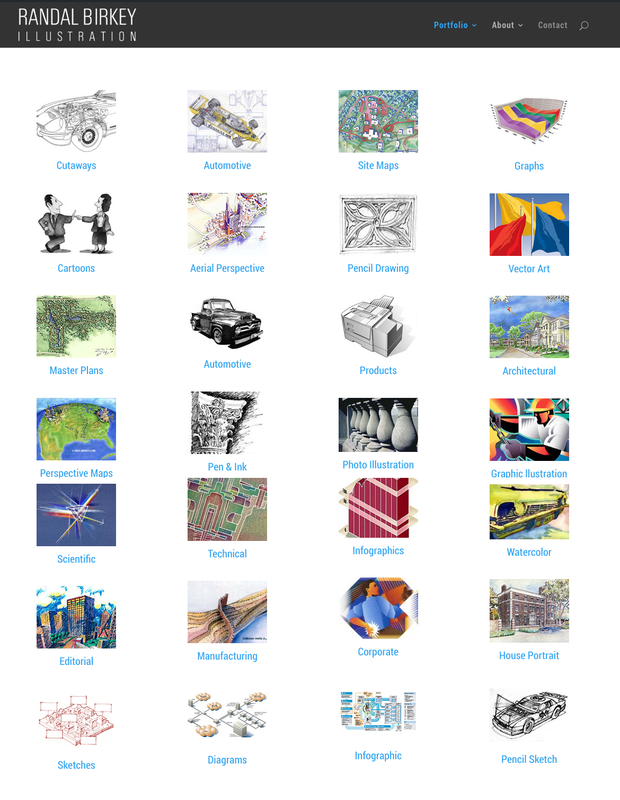 I used this website from 1996-1999 for providing information about and promoting my own freelance illustration and design business. I also used my site to promote my brother’s beekeeping website at Beesource.com. Notice the link in the upper left hand column to the Association for Multimedia Communications. Iserved on the board of that non-profit association at the time working with: Harvey Tillis, Dave Boller, Barry Koehler, Lou Morelli, Lee Hoffner, Paul Marvine, Michael Mizen, Tim Schwaar, Michael Schaffner, and many others. At the bottom of this early web page is a reference that I had just changed my hosting from my first ISP – TheRamp, to Morelli Systems. My AMC friend Lou Morelli had offered to host my site at the Morelli Systems data center. It was through working with Lou that I eventually met Mark Goeke, who became a good friend. Mark later left Morelli, and worked from 1999-2007 in sales for BIRKEY.COM, bringing us a lot of clients and business including: Scholle Packaging, Amsted Industries, The Petersen Automotive Museum… to name just a few. Also included on this page was contact information to my illustration artist rep, Connie Koralik. In looking through the archives of the Way Back Machine, I was reminded of what my illustration website at BIRKEY.COM looked like on October 12, 1999. This was the second version of the web site design. 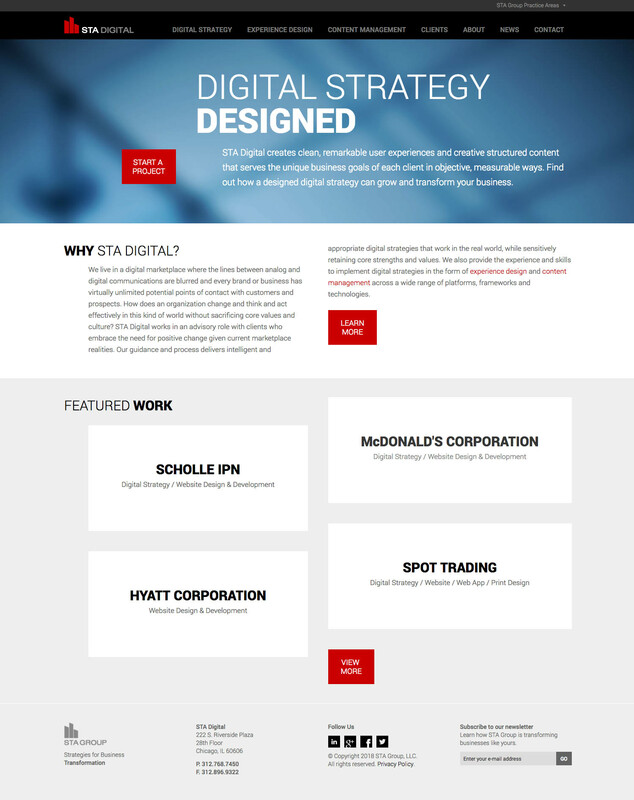 The concept was inspired by the LaSalle Partners website at that time. Since I was doing a lot of architectural illustration (including La Salle Partners), the idea of using a building metaphor was a natural. I used my architectural illustration background to design and illustrate the images, and create the interface. As you can see, I was still publicizing my membership and involvement in the AMC. The site was also still hosted with Morelli Systems, and I even had a banner ad on the site for Morelli. I was also using a visitor counter… something very common and popular back then. 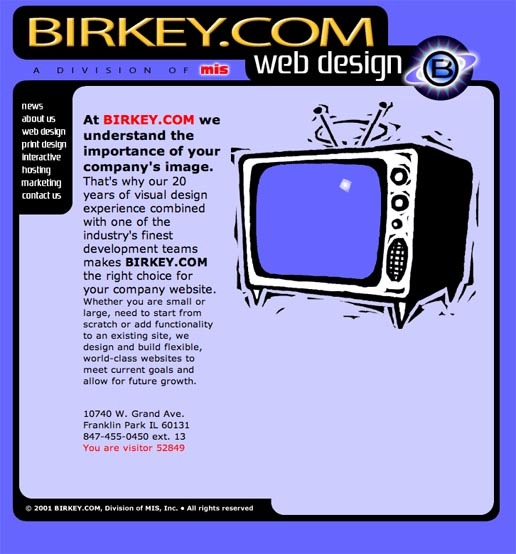 Below is the third major redesign of the BIRKEY.COM site since its founding in 1996. This version (3.0) was done a collaboration with the Creative Director of BIRKEY.COM, Corey Wilkinson. 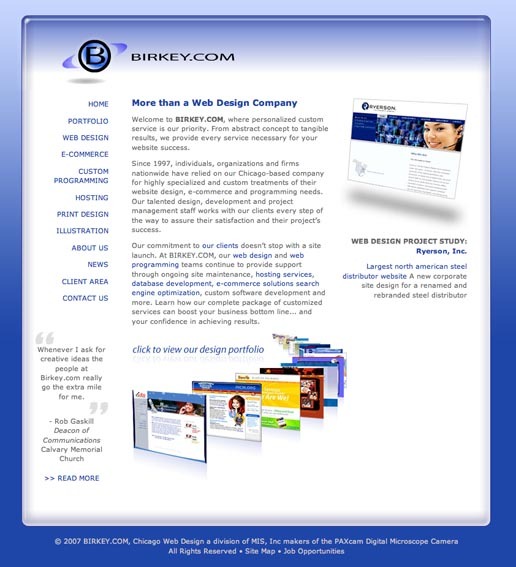 This was the first design that communicated the merge of my one man BIRKEY.COM operation with Midwest Information Systems, Inc. as a Chicago web design division. We used a “retro” look and color palette, and built the site in Microsoft ASP, with a Microsoft SQL Server database Backstage. When you rolled over the navigation items on the left, the TV screen displayed different retro style images. The “circle B” logo designed by Corey was animated using the animated .GIF format. It was during these years that I hired a number of people to become a part of the team including: Corey Wilkinson, Kyle Williams, Daniel Puczek, Barry Koehler, Nicko Sahlas and many others. I think we were up to 12 at one time. 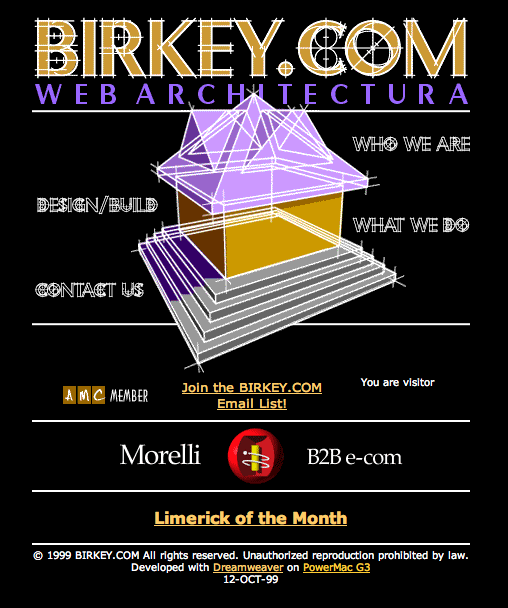 The final installment in this retrospective was in April 2006, as the BIRKEY.COM website was relaunched with a version 4.0 redesign, as can be viewed below and in the Way Back Machine. The interface and logo was designed by Corey Wilkinson, Creative Director at BIRKEY.COM. It was a database-driven site managed by the Birkey Backstage, a custom Content Management System (CMS), built in classic Microsoft .ASP and a Microsoft SQL Server database. I sold my BIRKEY.COM division web design business and formed a new web 2.0 media company called Headstand Media, headquartered at 333 W. Wacker Dr. in Chicago. We moved that business to 1 N. Wacker Dr. in Chicago in 2009. The BIRKEY.COM domain was returned to Randal’s control in 2009, 2 years after the sale. The name and domain has been switched back to its original use as Randal Birkey’s illustration portfolio website – full circle from its beginnings in 1996. The site is now developed and updated in WordPress. After nine years of managing Headstand Media and the STA DIGITAL, I transitioned back to my freelance roots providing consulting, web strategy and design services from a new location near Madison, Wisconsin.